If you want to prepare for the QUANTITATIVE APTITUDE for these exams then you should have a clear knowledge about the pattern and the syllabus of these exams because there are various similarities as well the differences between the pattern and the type of questions asked in these exams. The various topics for the quantitative aptitude of bank exams include simplification and approximation, number series, inequality, profit and loss, average, ratio and proportion, speed, distance and time, time and work, probability, pipes and cisterns, simple and compound interest and permutation and combination and data interpretation. The questions of the quantitative aptitude of the BANK exams are of calculative nature so you have to be very fast while solving these type of calculative questions and you have to learn the various easy and quick tricks to solve these questions at a fast rate. Although the syllabus for SSC Quantitative aptitude includes percentage, ratio and proportion, problems on ages, speed, time and distance, average, number series, number system, time and work, mixture and allegation, data interpretation. In Advanced Mathematics topics like Algebra, Geometry, Trigonometry and Coordinate Geometry are included which are the vital component in SSC exam. 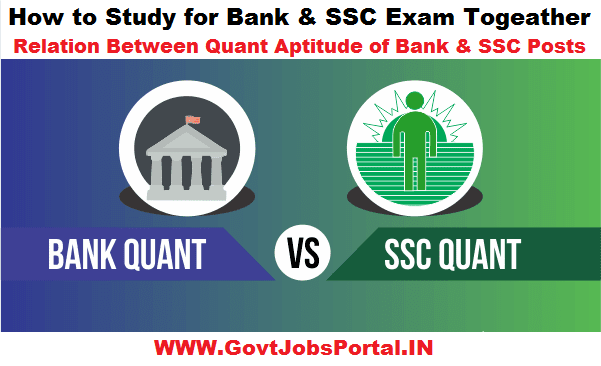 These topics are not significant for Bank Exams but you should have a thorough knowledge of these topics for the SSC examination point of view. So you need to concentrate separately on these topics when you are preparing for the SSC exam. Data Interpretation is a very essential topic for both of these exams. A comparison table is given below which can explain you that what kind of topics are included in which exam and what are the same and the different topics included in both exams and if you want to prepare for these two exams together then what common topics you can learn for both the exams. So students now you have an idea about the similarities and differences in the syllabus of both the exams so just prepare for the common topics first and then go for the different topics later on. Devote separate and extra time for the different topics. For preparing the common topics you should have a keen knowledge about the pattern and type of the questions which are asked in the exams, for this you can go through the different mock test, just solve then and evaluate yourself. Work upon your weak points and strengthen your strong points. Just work on a plan and you will surely get a success.